This article is about a preparation of cannabis leaves and flowers. For the similarly-named cannabis pipe, see Bong. Bhang (Hindi: भांग) is an edible preparation of cannabis. Traditionally it has been used in food and drink for centuries dating far back as 2000 BCE in the Indian subcontinent. Bhang in India and Nepal is distributed during some Hindu festivals like Holi, Janmashtami, Shivratri, and consuming bhang at such occasions is common. Bhang is an edible form of cannabis which has been used in India since before the Vedic period, and is an integral part of Indian Hindu culture. Hindu monks make use of the effects of bhang to boost meditation and to achieve transcendental states. In the ancient text Atharvaveda, Bhang is described as a beneficial herb that "releases anxiety". Hindus associate it with two of their most powerful deities Lord Krishna, and Lord Shiva. One of Shiva's epithets was "Lord of Bhang" as he is said to have discovered the transcendental properties of the mixture. Legend has it that Shiva brought bhang from the Himalayas for the pleasure of mankind. A famous Greek historian Herodotus who lived in the 4th century B.C. mentions the use of bhang among Indians. A 15th century Indian document refers to Bhang as light hearted, joyful, and inspirational spiritually to the mind and body. India’s holy men ritually use Bhang in order to facilitate communication with their deities. According to a legend, Siddhartha Gautama lived on a daily ration of one bhang seed and nothing else during his six years of asceticism. In 1596, Dutchman Jan Huyghen van Linschoten wrote three pages on "Bangue" in a work documenting his journeys in the East, also mentioning the Egyptian Hashish, Turkish Boza, Turkish Bernavi, and Arabic Bursj forms of consumption. The historian Richard Davenport-Hines lists Thomas Bowrey as the first Westerner to document the use of bhang. Anywhere on the ghats, one can find large numbers of men engaged in preparing bhang. Using mortar and pestle, the buds and leaves of cannabis are ground into a paste. To this mixture, milk, ghee, mangoes, and Indian spices are added. The bhang base is now ready to be made into a thick drink, Ghota (on ShivRatri) thandai, an alternative to alcoholic beverages; this is often referred to casually, if inaccurately, as a "bhang thandai" and "bhang lassi". Bhaoong is also mixed with ghee and sugar to make a purple halva, and into peppery, chewy little balls called golee (which in this context means Bullet or Pill in Hindi). Bhang has been an integral part of the traditions and customs on the Indian subcontinent for the past four thousand years and persists as a practice today. 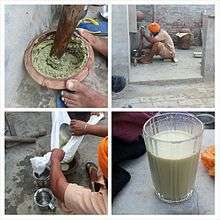 Bhang lassi is a preparation of powdered green inflorescence with curd and whey put in a village blender (a hand blending operation is carried out till the butter rises). It is regarded as tasty and greatly refreshing, with one or two large glasses having little effect. It is legal in many parts of India and mainly sold during Holi, when pakoras containing bhang are also sometimes eaten. Uttar Pradesh is known to have licensed bhang shops, and in many places one can buy bhang products and drink bhang lassis. The tradition of consuming bhang lassi during Holi is particularly common in North India where Holi itself is celebrated with a fervor unseen elsewhere. Bhang is heavily consumed in Mathura, an ancient town of religious importance to the Hindus. Here the practice is believed to have been introduced by the followers of Lord Krishna and has stayed ever since. They begin the preparation by Sanskrit chants and recitation of prayers. In Mathura, some people take bhang to work up their appetite while others do it to de-stress. 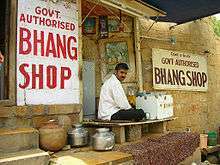 But the hub of bhang use is Varanasi (or Banaras) where the bhang is prepared on its famous ghats. Bhang is also available as bhang goli which is just freshly ground cannabis with water. Apart from this, sweetened bhang golis are also widely available; these are not considered a drug, but a traditional sleeping aid and appetizer. Bhang goli has metabolizing effects after approximately two hours, sending one into a dreamlike meditational state. Bhang is also part of many Ayurvedic medicinal preparations; bhang powder is available legally at ayurvedic dispensaries. As bhang has served such an important role in India's culture and spiritual practices it would be impossible to criminalize cannabis completely in the country. Cultivation of cannabis is government regulated, and illegal without a government permit. Sale of bhang is also government regulated and illegal without a permit. ↑ "Right kick for day-long masti". Times of India. Retrieved 17 March 2014. ↑ "Holi 2014: Festival Of Colors Celebrates Spring (SONGS, PHOTOS)". Huffington Post. Retrieved 17 March 2014. ↑ Burnell, Arthur Coke & Tiele, P.A (1885). The voyage of John Huyghen van Linschoten to the East Indies. from the old English translation of 1598: the first book, containing his description of the East. London: The Hakluyt Society. pp. 115–117. Full text at Internet Archive. Chapter on Bangue. ↑ Davenport-Hines, Richard (2001). The Pursuit of Oblivion: a global history of narcotics 1500—2000. London: Weidenfeld & Nicolson. pp. 1–2. ISBN 0297643754. Wikimedia Commons has media related to Bhang.